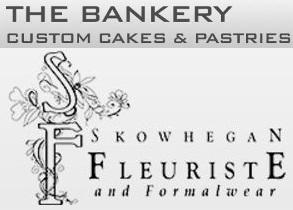 Downeast Newsletter - corrected show schedule, please note! September 14-16th, 2018 This will be the 10th annual Downeast Medal Finals! Visit our website for more information about Downeast. We welcome all questions, suggestions, and sponsorship: please email Ginger at galbert@maine.rr.com . DMF is excited to announce we will have 2 judges for the Derbies and all of the Medal classes! Check out this amazing 10th anniversary video from Riitta Fortier, celebrating 10 years of Downeast Medal Finals!!! 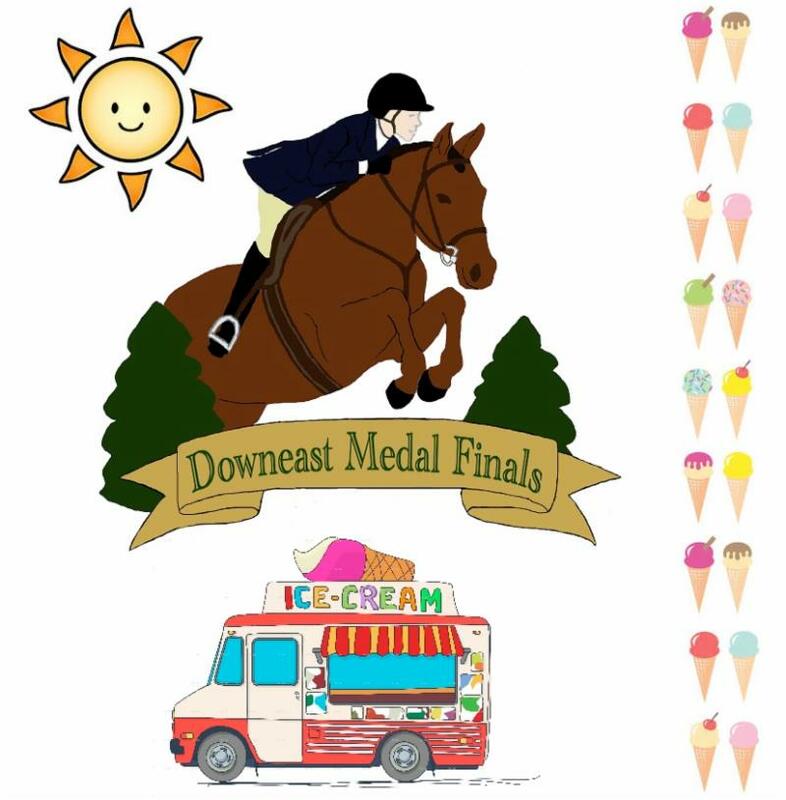 Dover Saddlery is proud to be a Presenting Sponsor of the Downeast Medal Finals. For over 45 years Dover Saddlery has supported horse and rider starting with their very first lesson. We understand your commitment and dedication to your riding and horse and we commend you for your accomplishment. ﻿At Dover Saddlery, we offer over 50,000 quality products based on performance and world class customer service from riders just like you. 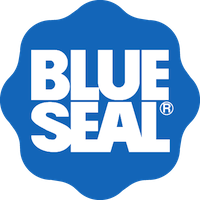 Everything we offer is backed by our 100% satisfaction guarantee. Best of Luck as you begin your show season and we look forward to seeing you at Finals. Enjoy the journey and thank you for riding with Dover Saddlery. Continue reading below for ten important things to remember when your horse is colicking on the farm as well as ways to decrease the risk of colic. 2) Check your horse’s vital signs. Try to get a heart rate or pulse rate, either by using a stethoscope to listen directly to the heart (just behind the elbow of the front left leg, under the shoulder) or get a pulse rate by feeling the facial artery underneath the horse’s jaw. A normal heart rate for most horses is between 28 and 44 beats per minute. If the heart rate is above 44 beats per minute, it is elevated and could be due to pain. Grab a thermometer and check to see if the horse has a fever – a normal rectal temperature should be between 99F and 101.5F. 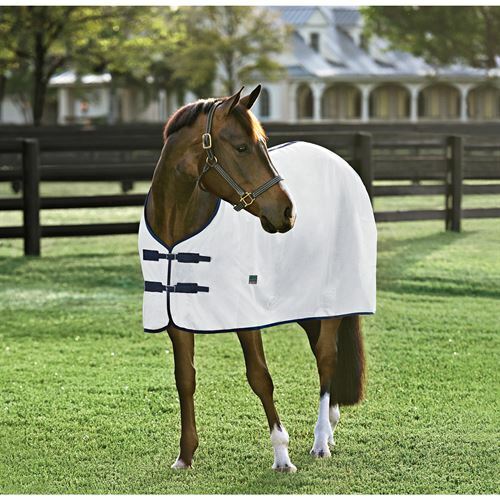 Take your horse’s respiratory rate, which should be between 12 and 20 breaths per minute. Check to see if there is any manure present in the horse’s stall or paddock, and if so is it normal consistency, dry, or diarrhea. 3) Call your veterinarian as soon as you are suspicious that your horse is colicking. Whether the clinical signs are severe or very subtle, waiting too long could allow small problems to become critical and critical problems to become untreatable. Describe your horse’s behavior to your veterinarian, and let them know the vital parameters if you were able to obtain them. It can also be beneficial to let your veterinarian know if the horse has a history of colic. Lastly, let them know if feces were present in the stall and if the horse has been eating and drinking normally. With this information, your veterinarian can better assess the horse over the phone as well as the severity of the colic. 4) While you are waiting for your vet to arrive, make sure your horse is not rolling, pacing or thrashing, as this can lead to further injury. Hand walk the horse if they continue to roll or thrash in a stall. 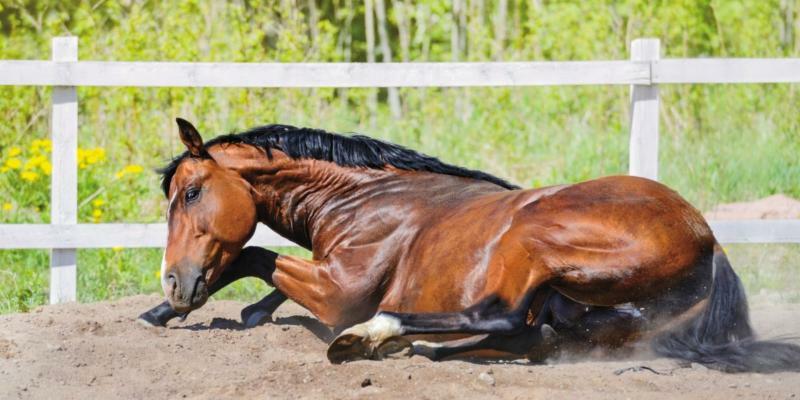 If the horse will lie down quietly, without rolling or constantly getting up and down, this is okay. Sometimes, it is easier for gas to be passed when they are recumbent. Check on your horse every 15 minutes. Colics can progress rapidly in some circumstances and need to be closely monitored so that any deteriorating condition can be treated promptly. 5) Restrict access to any feed while you are waiting for your vet. Food can often make the existing problem worse, even though some horses still have an appetite when they colic. It is also important to limit any water intake until a veterinarian has passed a nasogastric tube to check for additional fluid (reflux) causing distension of the stomach. Excess water could lead to a ruptured stomach. 6) You should talk with your veterinarian over the phone before medicating the horse, since anti-inflammatories, analgesics and sedatives can mask clinical signs, which can make it more difficult for the veterinarian to properly diagnose the severity of the colic. If the horse is very painful and needs medication immediately before the vet can arrive, be careful not to overmedicate. Banamine® (flunixin meglumine) should only need to be given once every 12 to 24 hours. If banamine is not decreasing the horse’s level of pain, then the horse needs stronger pain medications and potentially medical or surgical treatment. 7) Whenever your horse is colicking, it is important to keep in mind whether the horse has the option of going to a referral center for further medical or surgical treatment. The sooner the horse is treated medically or surgically, the better the prognosis will generally be. Financial concerns play a huge role in this decision and so it is important to think about this before an emergency actually occurs. A medical colic that requires IV fluid therapy can cost up to $5000 and surgical colics can range from $5000 to over $15000 depending on complexity and postoperative complications. If you have an insurance plan, make sure you know beforehand how much your company will contribute. 8) Once you decide that the horse can no longer be medically managed at the farm and you would like to take it to a referral center, start to plan for transportation. Do you own a trailer or will you have to call a shipper? It is important to have a trailering plan in place before an emergency occurs so that time is not wasted trying to find a ride. If it is possible for the horse to be shipped in a box stall, or to remove the partition in a smaller trailer, this is best in case the horse goes down on the way to the referral center and becomes trapped between the divider. Never travel in the trailer with a colicking horse, as this can quickly become dangerous for the passenger. 9) Many colics occur due to changes in frequency of feeding, type of feed or hay, or decreased water intake. It is best to feed smaller amounts of feed more frequently throughout the day if this is possible. Any changes to your horse’s feed should be made very gradually over 10 to 14 days. Forage should always be the main component of a horse’s diet unless special circumstances discussed with your veterinarian state otherwise. Finally, always monitor your horse’s water intake and be sure to encourage them to drink as much as possible. This is especially helpful with preventing impactions. Whether this means adding some water to their grain, or putting out an extra water bucket with some electrolytes, it is important to take extra steps to ensure that they are staying hydrated. 10) Management strategies, such as effective deworming protocols, gastric ulcer prevention, and regular exercise all play a role in maintaining a healthy horse with a lower risk of colic. Always refrain from giving medications unless instructed by your veterinarian, since NSAIDs, such as Bute® (phenylbutazone) or Banamine® (flunixin meglumine), can cause gastric ulceration, and antibiotics can disrupt the natural microflora of the gut and predispose to colitis. Colic can be a scary condition when it happens to your horse, but taking steps to prevent it and being prepared to deal with it can certainly help everyone remain calm in the incidence that it does occur. If you have any questions regarding this article, or the treatment and prevention of colic, please contact your veterinarian or the doctors at New England Equine Medical & Surgical Center. Thank you to New England Equine Medical and Surgical Center for allowing us to reprint this article, which can also be found here . Thank you so much to our incredible sponsors who help make this show possible. Thank you to Spotted Vision Photography and Riitta Fortier for providing us with many wonderful photographs from 2017 Downeast Medal Finals.